Clarets boss Sean Dyche has had no contact with Everton over their managerial vacancy. And he revealed he hasn’t spoken to any clubs, having also been linked with the job at Leicester City last week. 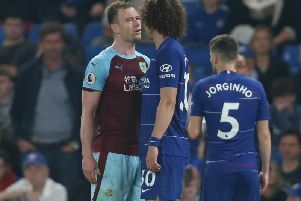 Dyche has been spoken about in various quarters in the national media, and numerous pundits have suggested the Toffees should make a move for the Burnley custodian, on the back of the job he has performed in five years at Turf Moor. He continues to admit it is “flattering” to be mentioned in that regard, but any talk is hypothetical, having not held discussions with any potentially interested parties. Asked if Everton had spoken to him, he said: “No. No contact from any clubs. "I've said a few times of varying clubs that have been mentioned and nothing’s changed, you're always flattered because it recognises the work myself and my staff do. "It's other people's story, it's not mine, but it's right that I get asked about it, of course. "Yet again it's another good club. I'm respectful of all clubs in all situations, but I'm equally respectful of my situation here. "I've had the experience of those sort of links at various times more so the last couple of years. I've just continued to get on with what I do here and that's the focus." There has been a suggestion that Dyche should take any opportunity to further his career now, while his stock is high, but he countered: “I don’t know, is it? Why is it so important? “You could argue I have made the right decisions by not going anywhere else, by staying. ”That’s equally the same sort of balanced view of it. “There are people in the game who say ‘you are doing okay, stay where you are’, because the grass is not always greener. You have to know what you are at now. “Somewhere down the line of course I am ambitious enough to wonder what is out there. And he sees no reason why Burnley can’t continue to move forward: “It’s about constant progression. It’s not about putting down a marker out there. We are very open minded and I’ve worked like that since I’ve been here.